Samsung are a company that seem to believe that you can never have too many products, and the new Samsung Galaxy Star and Samsung Galaxy Pocket Neo seem to be designed to fill in some of the tiny gaps in Samsung's massive product range. 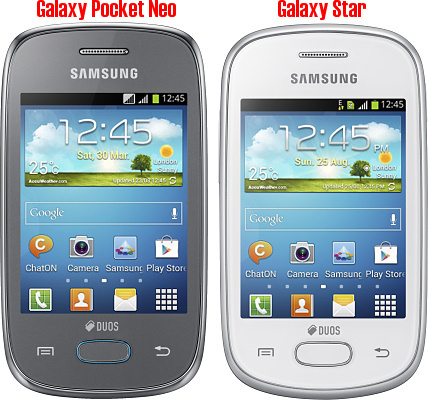 Both the Galaxy Star and Pocket Neo feature a 3" 240 x 320 pixel display, a 2 megapixel camera on the back, with 512MB of RAM plus 4GB of onboard flash and a microSD slot, a 1200 mAh battery, and both run Android 4.1. In addition, both handsets have optional dual-SIM capabilities and an FM radio, Bluetooth 4.0, WiFi and GPS and GLONASS positioning systems. There are some important differences though. The Samsung Galaxy Star has a 1GHz processor but does not support 3G data, which will make the phone a little cheaper and indicates that it might be sold in India, a country that doesn't have much in the way of 3G. The Galaxy Pocket Neo has an 850MHz processor but does support 3.5G data. You'll find the usual Samsung software enhancements here, but ultimately these are going to sell on price. Samsung haven't said how much the Galaxy Star and Pocket Neo will be or when they will be available, but we would expect them to be well under the €100 price mark when they hit retail channels.